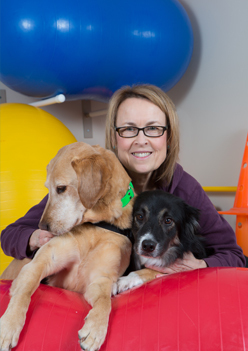 Kathy specializes in canine therapeutic and sports massage, trigger point therapy and in canine body conditioning. She has received her massage training from the Rocky Mountain School of Animal Acupressure and Massage in Denver, Colorado; and from Equissage in Round Hill, Virginia. She also holds a certification for Equine Massage. She continues to advance her education through various workshops and courses. As an equestrian, she studied dressage and received her British Horsemaster’s Designation from Porlock Vale, England. Training and riding horses, and competing, has educated her in movement, gait analysis and the principles of center of gravity related to dogs and horses in motion. 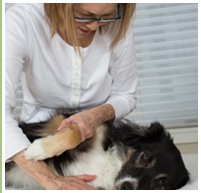 Over the last ten years, her interest has centered on dogs and their care. She currently has two highly spirited sport dogs of her own, Lily and BB. 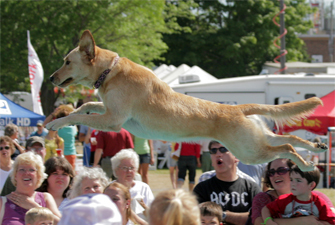 They engage in many dog sports including Dock Jumping, Agility, Flyball and Frisbee. 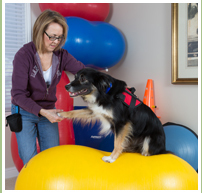 She has traveled across the United States to train with the best and has found her passion working with dogs. Lily is my adopted Goldador (lab/golden mix). She is a vibrant, high energy dog with a successful career as a dock jumper. In addition to doing well at our own National Cherry Festival, Lily has also done well on the national circuit. 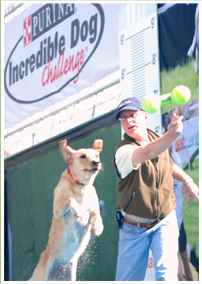 In 2009, Lily placed 6th in the nation in dock jumping at Purina’s Incredible Dog Challenge. You may have seen her on ESPN. Lily is the reason I got into canine body work. When we adopted her, we soon realized that we had a wild child on our hands. She had no fear and no trouble jumping off decks and cliffs. It soon occurred to us that we needed to put her into dock jumping where she would have a softer landing. She started her career right here in Traverse City at the Cherry Festival and the rest is history. She is beautifully spirited and one of the best dogs I have ever had! BB is my five year old adopted Border Collie. 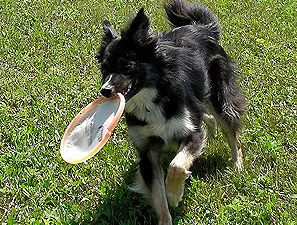 About two years ago, I was surfing the web after midnight one night and found a video of this beautiful black tri-colored Border Collie; he was playing Frisbee to music with Ron Watson of Pawsitive Vybes, Frisbee champion and well-known dog trainer. Watching this dog really moved me for some reason. After watching for a couple of minutes, I learned that he was available for adoption. Well, it was all over… in that moment, I realized how much I wanted to take this dog home… and finding him was meant to be. BB has turned out to be a great dog for us and does really well with the fitness training. Like a Border Collie, he will do anything he is asked to do and with great enthusiasm. BB knows all of the conditioning exercises quite well and he loves a good work out in the dog gym. I use him quite often for demonstration and workshops and he does an awesome job! Completed 4 in-depth training programs in Canine Body Conditioning with Bobbie Lyons and a variety of other professionals. Currently studying Advanced Methods of Canine Body Work.